Gallows Run Watershed Association - Save The World… Grow an Oak! Save the World... Grow an Oak! OK, so maybe we can’t single handedly stop tar sands mining or mountaintop removal, but anyone can grow a tree, or two or ten! It isn’t rocket science (it’s botany)! Some of the easiest trees to grow from seed are nut trees like oak. Here’s how. There are various types of oaks in this area. Some (white oaks, chestnut oaks) sprout (germinate) in the fall and some (red oaks, pin oaks) will germinate in the spring. 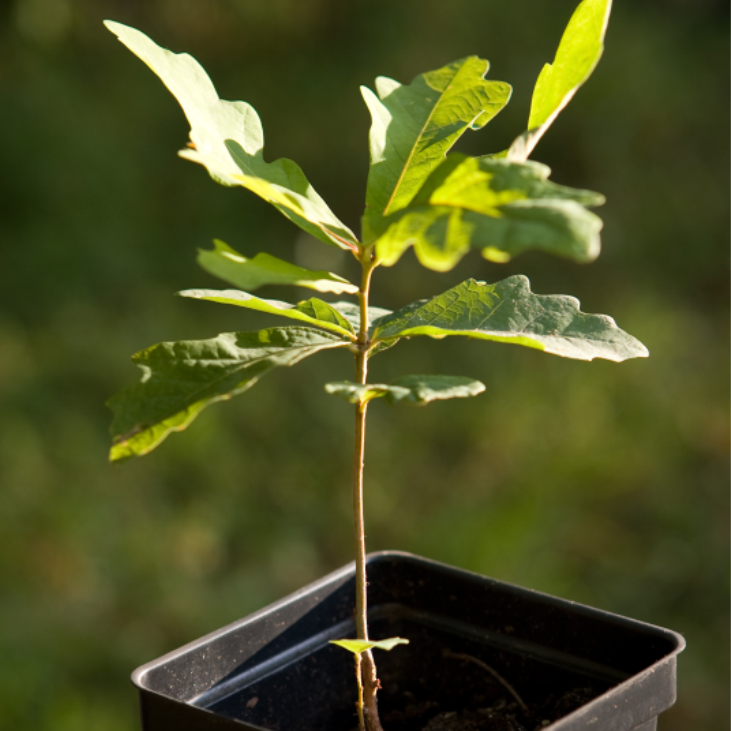 Here is how you can start an oak tree. a radical. Gather up a bunch of these along with any other acorns you can find. Separate the early sprouters from the others. Prepare a small pot with loose soil for each one. Lay the sprouted acorn on top of the soil and press it in slightly. Take care not to break the radical. Prepare a nice place for these pots outdoors and be sure to protect them from ravaging mice and squirrels. A box with a screened top works well. Then just let them winter over. 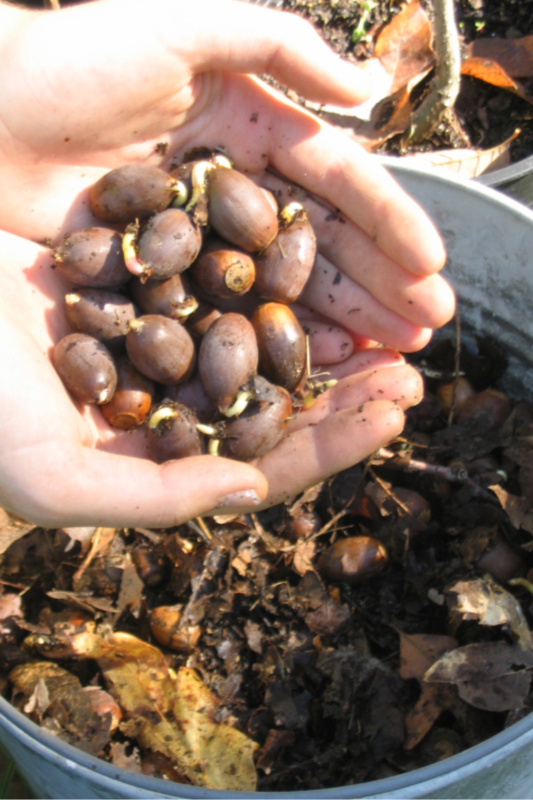 For unsprouted acorns, a float test can help see if they’re worth keeping. Some may be a little rotted or have worms chewing away inside. Just put them in a jar of water and see what floats. If an acorn floats it may indicate there is airspace inside the hull. Separate these and leave them out for the squirrels. Let the sinkers soak for a day or so. Then mix up some soil with peat moss or a bunch of crushed leaves in bucket. Spackle buckets work great for this, especially if you have the top. Moisten the soil slightly, mix in the acorns, put the top on the bucket and leave it out in the cold for the winter. A round March/April, check on your acorns to see if they’ve germinated. If so, give them each a pot of their own like you did with the early fall sprouters. Lay the acorns on top of the soil, water them lightly and let them grow. Keep them moist and protected. After a short time the radical will work its way down into the soil, and new growth will start growing upward. Oaks have deep roots, so after your trees start growing transfer them from their starter pots to something bigger and deeper. Now it is just a matter of taking care of you trees and watching them grow. Mice and squirrels become less of a problem as your trees age, but deer love them so be sure to keep them in a fenced-in area or on a deck. You can grow you trees in pots all summer and them plant them in the fall or keep them for another year to get a little bigger before planting. If you keep them for another year, mound the soil up around the pots over the winter. This helps protect the roots from the hard freeze. I also like to bury my trees in leaves for a little extra protection. When you are ready to plant, find a nice location with no overhead branches or overhead lines. Oaks don’t mind a little shade, so it is not critical to be in the sun; however, they do grow tall, and you don’t want them tangling in power lines or cables. Remove the turf layer and then loosen up the soil down to a foot or so. Water your tree then remove it from it pot. Gently rough up the roots a little, make a small hole in the loose soil and place your tree in the hole. Be sure not to create a depression where water can collect but instead keep things level or even mound up the tree a little. Here is a little video on how to plant your tree. Put some mulch or crushed leaves around the tree while keeping some air space immediately around the base. If mulch is piled up, it could cause it to rot. Then put a nice fence around the tree to ward off the deer and watch your tree grow for the next 100 years. There! You’ve just helped save the planet. For more information visit this website. And remember, you can’t grow too many trees!